^ "Qui est Laurent Gbagbo ?" 互联网档案馆的存檔，存档日期2008-08-02., FPI website （法文）. ^ 3.0 3.1 科特迪瓦前总统被押送国际刑院 涉反人类罪. 京华时报. 2011-12-01. 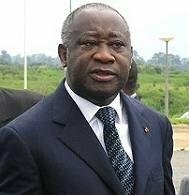 ^ Ivory Coast's Laurent Gbagbo arrives in The Hague. BBC. 30 November 2011 [30 November 2011].